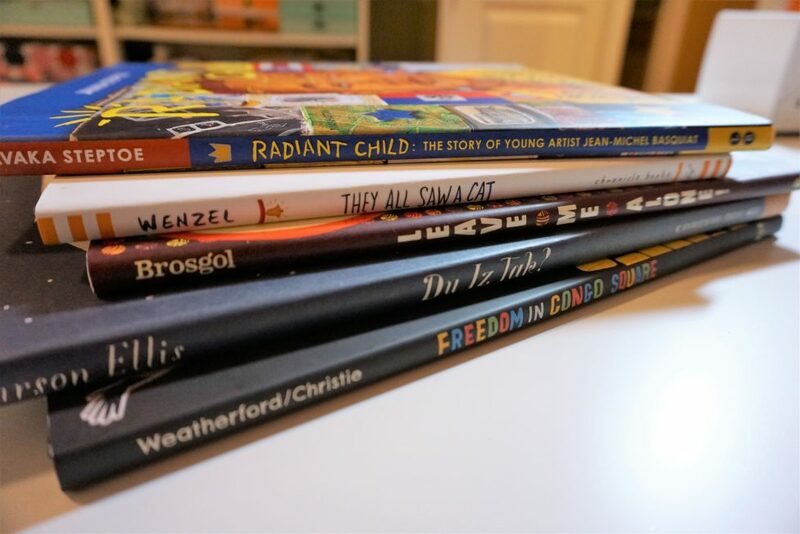 So as an elementary school librarian I often ended up with a lot of the Caldecott books every year anyway, either in my own personal collection or my library’s. The Caldecott award is given out every year by the American Library Association for the children’s book with the best illustrations. It’s basically the picture book Oscars, with some graphic novel exceptions. There’s one medal winner and a handful of honor books, depending on how many the committee picks that year. 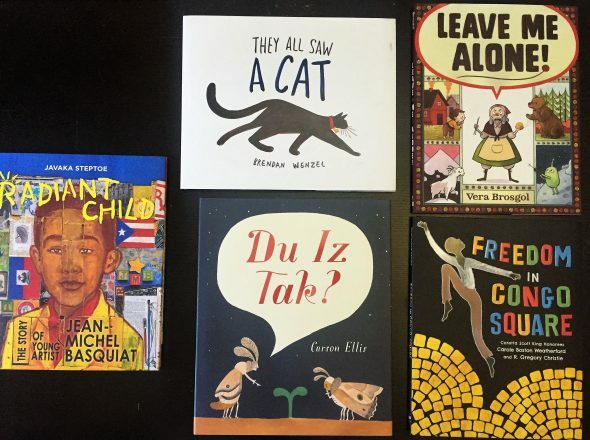 When I found out I was pregnant with H, in 2011, I just got this idea that I should start a library for her of all the Caldecott books published in her lifetime (and in her…incubator time? Gross). I taught the Caldecotts to my first grade classes every year, and it was always one of my favorite units. I started with 2011 because I basically just couldn’t wait, but she has every single Caldecott book that’s been awarded since she was born. This year is 2017, so…It’s her 7th year of Caldecotts. Which just feels absurd, but true (she’ll be 5 in March, and that pregnancy year makes it even more startling). It can be a challenge, the books sell out quickly. And some of them are always surprise winners, and the publishers have to print more copies of the books. We’ve waited months to get some of these books when they’re back in stock, so now my system is better. I immediately buy what I can from Amazon that morning, and I reserve whatever’s left on the list in store at a B&N somewhere within an hour’s drive from us. And then we go pick them up in person, so the collection comes together within about a week of the awards. She’s only 4 now, so some of these books hold her attention better than others. But she has them all, and it’s a gift I give to her every year to keep that thread alive of why I was a children’s librarian in the first place–to teach kids how to love books. Not read them, love them. It’s…a piece of my own passion for them that I pass on to her, and someday when she’s my age I hope she understands the connection I was trying to make with her, and with these books, and with words and images and art. And art is the word here. This year’s winner was Radiant Child: The Story of Young Artist Jean-Michel Basquiat by Javaka Steptoe. It’s a gorgeous story told with collage, and I love when children’s books about visual artists get recognized. They always have great, great pictures. Then the Honor books are They All Saw a Cat by Brendan Wenzel, Leave Me Alone! by Vera Brosgol, Du Iz Tak? by Carron Ellis, and Freedom in Congo Square, illustrated by R. Gregory Christie. 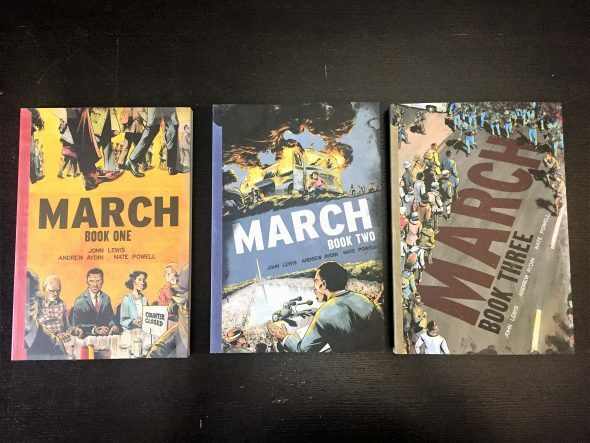 Then in another stunning bit of news out of the ALA, Representative John Lewis’s book March: Book Three took home 4 awards this year! That’s more than any author has received in the history of the awards. This is the 3rd book in his graphic novel series about his life and the Civil Rights Movement, and we bought all three books immediately. I’ve heard buzz about Book Three for a while, but I haven’t read any of them yet. I need to remedy that, but for now I was happy to throw my purchasing power towards this great icon, especially given the news about him just a week or so before. We’re off to a great reading start to 2017, and these additions will keep the progress moving. With a side of civics and economic activism.